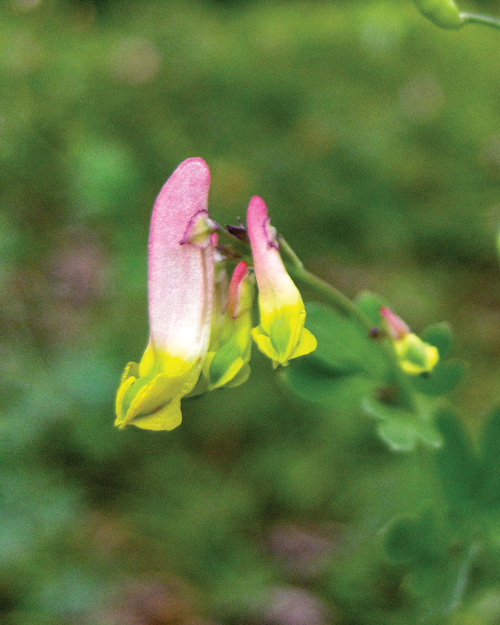 The wildflower show opens in early spring with small, ground-hugging blossoms only a few inches or so tall. Near the ground, they take advantage of the temperature moderating affects of the soil’s thermal mass. As the season unfolds, the tree canopy leafs out, and wildflowers grow taller, reaching for the sun and no longer held back by frosts. Unlike long-blooming, non-native annuals that pervade the nursery trade, native perennial wildflowers bloom briefly, anywhere from one to four weeks, depending on the species. Perfectly coordinated with pollinators, native plants develop robust root systems for a long lifetime of blooming and seed production. That means a regular visit to particularly robust nature preserves can reveal different wildflowers blooming each time. Jenny Jump State Forest has a magical variation in elevation and terrain that makes it a rewarding site for spring forest flowers. Outcrops along Jenny Jump's Summit trail yield impressive vistas. The main entrance to the Jenny Jump Forest is in Hope Township, Warren County on State Park Road. The tame, grassy area around the visitor’s center quickly gives way to nearly 4,500 acres of wild, rocky terrain shaped by glaciation. The wild poses of pignut hickory, black birch, and chestnut oak greet visitors, their eccentrically bent trucks and branches sculpted by the wind and shallow soils. Beneath the trees are a host of wildflowers and flowering shrubs. The showiest portion of the preserve in mid to late spring is the Summit Trail. A wild garden flourishes along a series of rock outcrops. Most hikers pause for the vista, but looking at the forest floor is just as scenic. In May, the ridge lights up with the white blooms of Solomon’s seal and Solomon’s plume. 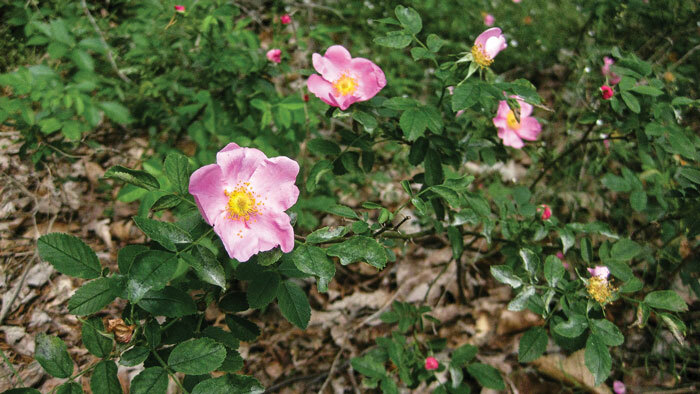 June brings on the deep pinks of Carolina rose (Rosa carolina), a small shrub that reaches just a couple feet tall. This wild rose blooms in such an extensive area, it seems almost garden-like. Pinks will be succeeded in the coming months by yellows of a wild, perennial sunflower called woodland sunflower (Helianthus divaricatus). June brings on the deep pinks of Carolina rose at Jenny Jump. Difficult conditions at the ridge include extreme heat and light, drought, and possible wildfire, making for adaptive plants. In exceptionally tough years, perennial plants may thin out, regardless of how well-adapted they are. On this temporarily open ground, annuals and biennials germinate and thrive until they are once again outcompeted by perennials. Venus’ looking glass (Triodanis perfoliata) and rock harlequin (Corydalis sempervirens) are two examples. Though these flowers have small flowers, when in abundance they are stunning. 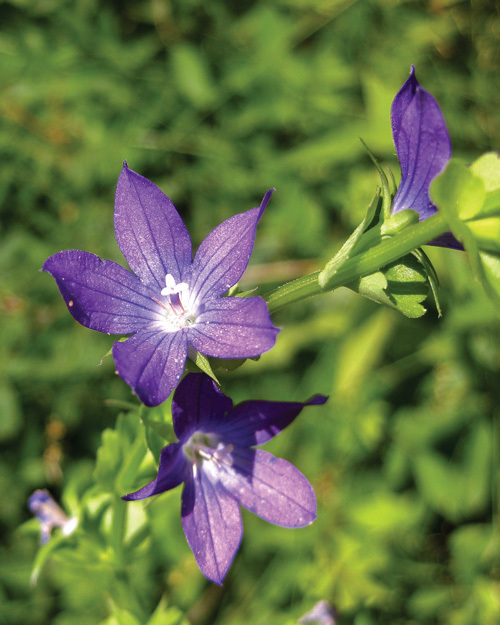 Venus’ looking glass has copious purple blooms with five petals. Rock harlequin has pink flowers with yellow tips. Their shape is slipper-like, and the plant’s form is arching, giving it the appearance of cascading down the bony rocks from which it grows. While the Musconetcong Gorge features many lush, moisture-loving shrubs, Jenny Jump’s woody plants reveal adaptations to the often dry and exposed landscape. Two heaths thrive in the understory: Blue Ridge blueberry (Vaccinium pallidum) and black huckleberry (Gaylussacia baccata). Both have small, waxy foliage that prevents desiccation. The blueberry bears the familiar white, bell like flowers of its cultivated cousin. Huckleberry’s flowers are shaped similarly and are a deep red. Another heath, Mountain laurel (Kalmia latifolia), has waxy leaves and large, white flowers visited by bumblebees. Venus’ looking glass dominates on open ground. Rock harlequin dominates on open ground. Alumroot, which thrives on Jenny Jump’s ridgetop was once used as a mordant to fix dyes. Indian pipe grows in moister spots. Yellow stargrass also prefers in moist areas. Ridgetop habitats can be moist in the spring, but will certainly dry out during an average summer. 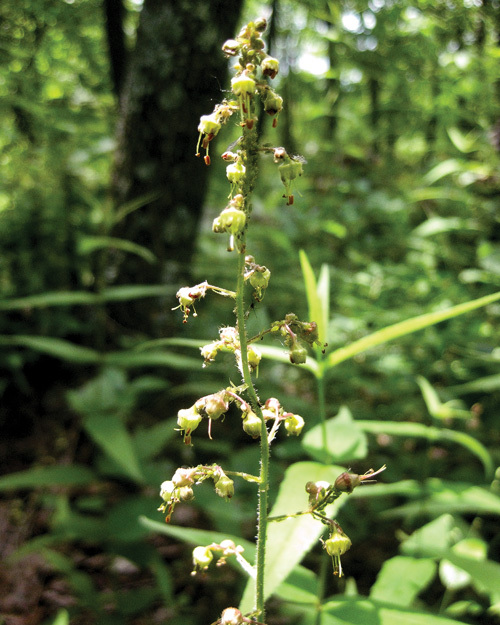 Alumroot (Heuchera americana) is one such wildflower that does well in Jenny Jump’s forest. Alumroot was once used as a mordant to fix dyes. Its tiny flowers would be easily overlooked but small pollinators enjoy its bright orange pollen. In moister spots, Indian pipe (Monotropa uniflora) and yellow stargrass (Hypoxis hirsuta) grow. The latter is aptly named. 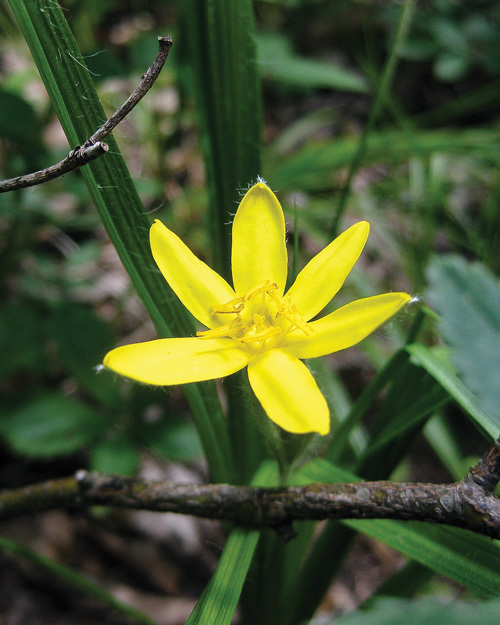 Its foliage is grass-like, and its bright yellow flowers have six pointy petals. Indian pipe has another evocative common name -- ghost plant. The entire plant is an ethereal white because it does not photosynthesize. Instead, its roots form a relationship with the soil mycorrhizae (fungi), the same mycorrhizae that trees use to help absorb essential minerals and nutrients. 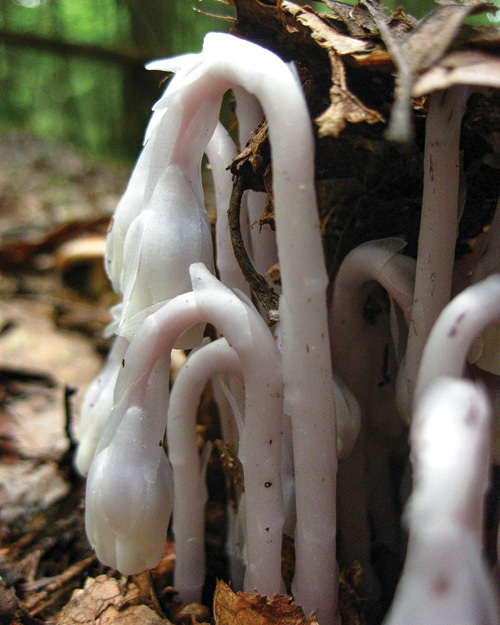 This connection to trees allows Indian pipe to survive. This vast underground community connects many of the forest plants, ensuring a thriving network. The trees do well, providing shade to the understory. The shrubs and wildflowers flourish, creating pockets of stable soil and moisture for seeds to lodge. Soil-based fungal communities are invisible yet essential to healthy, robust plant populations. Jenny Jump also features some subtle beauties of the plant kingdom. Rattlesnake plantain (Hieracium venosum) bears small, dandelion-like flowers and colorful foliage. Like common dandelion, the leaves hug the ground in a rosette. Each paddle-shaped leaf is artistically patterned with maroon along its veins. As the plant matures, the maroon fades to green. Bottlebrush grass (Elymus hystrix) flowers open up at this time of year. A fairly common grass of moist to dry part shade, its large, flowerheads resemble bottlebrushes. Jenny Jump’s Summit Trail luckily has few invasive plants and has generally light deer browse on spring wildflowers. One unfortunate introduction to the park is viburnum leaf beetle (VLB), an invasive Eurasian insect discovered in Canada last century. The foliage of Downy arrowwood (Viburnum rafinesqueanum), a native viburnum at the park, is often in tatters due to VLB’s eating habits. 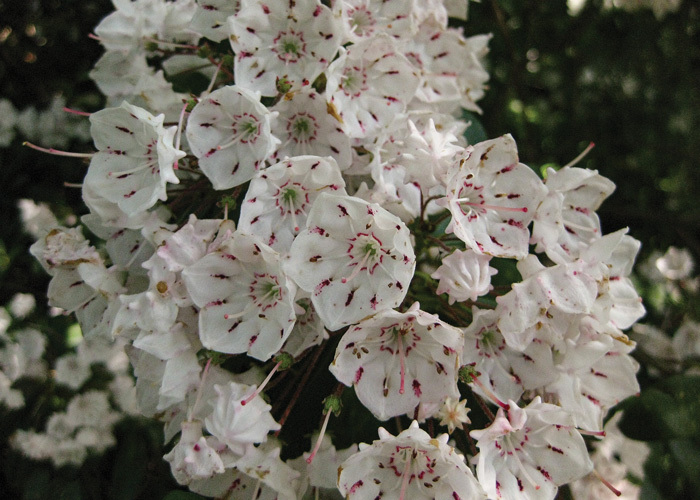 Mountain laurel has waxy leaves and large, white flowers popluar with bumblebees. 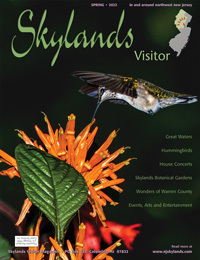 The best ways to enjoy New Jersey’s late spring wildflowers are in person, using the senses. Smell the roses—and the carrionflower, too, if you dare. Gently feel the silky texture of Solomon’s seal and wild ginger. Let your eyes and camera record the colorful petals, sepals, and leaves. 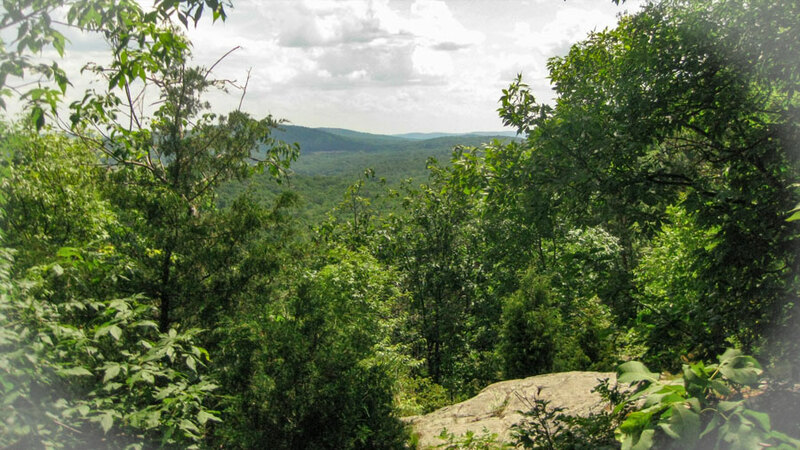 Jenny Jump State Forest is just one of the many exceptional wildflower spots in New Jersey. 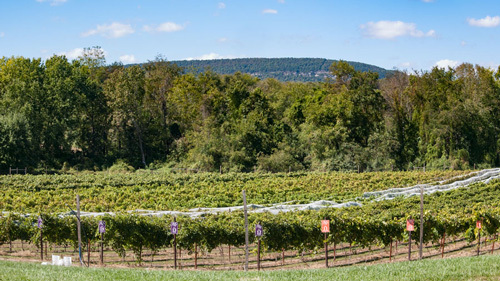 Rachel Mackow and her husband, Jared, own and operate Wild Ridge Plants in Pohatcong, where they grow nursery propagated native plants that are available wholesale or retail. They also offer consulting and contract growing services. Click or call 908/319-7230. 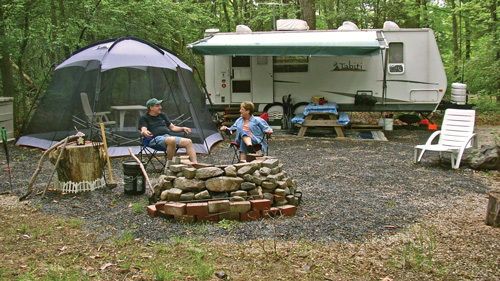 Private campground for RVers and Tenters with wooded sites available by the day to by the season. Rustic cabins also available. 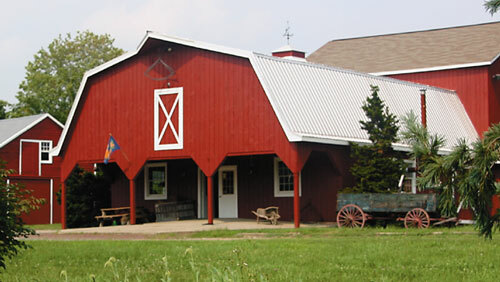 Home of Lakota Wolf Preserve. PYO apples, several varieties including semi-dwarf trees (great for kids). Peaches from our orchards, pumpkins, farm market. Wagon rides on fall weekends. Near the beautiful Delaware Water Gap, Rt 80 ex 4 to Rt 94 N, 3 1/2 mi to Frog Pond Rd. You?ll be glad you found us!